Norway natural environment is special: first and foremost it’s the topography of Norway. Nowhere else in Europe can one find such wide upland plains, offering a sensation of boundless freedom. 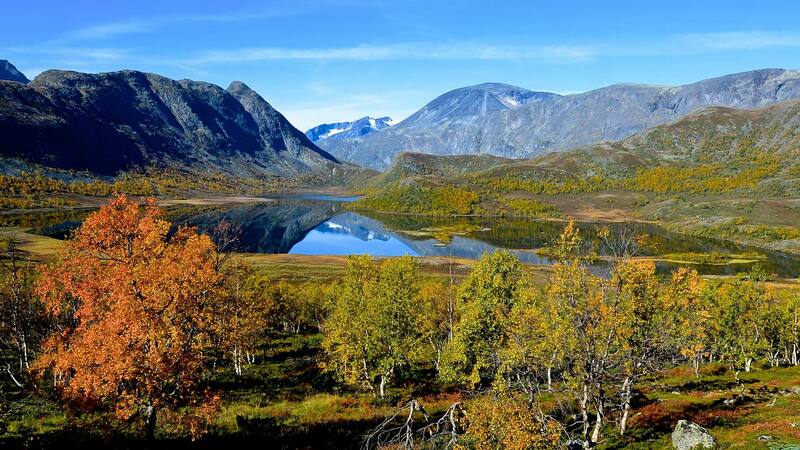 Hundreds of mountain peaks topping 6500 ft guarantee spectacular views throughout the Norwegian mountain ranges. And where else can one swim in the sea in the height of summer and then drive into the mountains and put on one’s skis? The fjords of Western Norway are a labyrinth of sea arms, the coastline is a playing field of innumerable islands and skerries. Fascinating natural phenomena are the summer midnight sun and the northern lights in winter. North of the polar circle, depending on latitude, the sun does not set from the middle of May until the end of July. Playing golf at midnight, fishing at 3 o’clock in the morning is no problem in Norway. During the winter months one can regularly witness the northern lights’ multicoloured ribbons moving up and down in the night-time sky, as if dancing. They appear when charges of positively and negatively charged solar particles penetrate the earth’s atmosphere and, at altitudes between 60 and 200 miles, collide with the neutral molecules of the earth’s atmosphere. With a bit of luck, the northern light is visible in Southern Norway as well.